Support the England football team the way your dad and grandad used to..... but with an iphone. 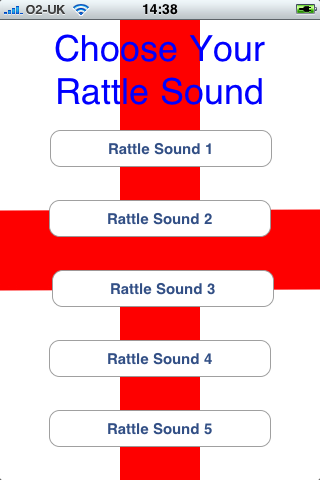 Doesn't matter whether you're at the game, in the pub or even at home, the England Football Rattle is a great way to show your support for the England Team. It works just like a real football rattle. Wave your iphone or ipod as you would the handle of a football rattle to create the rattle sound. The rattle will speed up or slow down according to the speed and vigour with which you wave your device. With five, different rattle sounds to choose from, you will be the envy of all of your iphoneless/ipodless friends.